is in the air here in Wisconsin and I finally feel like I can go at my floral images with abandon! I LOVE to color flowers and those images are probably 90 % of my stamp collection. I suppose that butterflies would be my next fav to color ;-) Anyways, just a quick post today as I want to get out into the sunshine for an extended walk. I think I have said before that I will be walking 60 miles in August for breast cancer. I went to this walk in San Francisco in September of 2011 and it was such a positive experience that I want to try it again. So, each day I really need to try and get out there for a loooong walk. 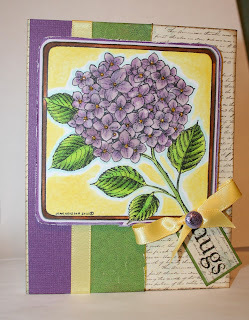 But, back to my card.....I used a Northwoods Rubber Stamp Co. (man- I love their stamps!) floral image and colored it with copics. I stickled the center of each flower with a sunshine yellow stickle, mounted it on several layers of patterned paper and cardstock and that's about it I guess. Oh, I guess I also lightly ran my scissors down the green paper strip as well as around the deeper purple square to add a bit of distressing. I hope you are also enjoying your day and I plan to get around to more blogs tonight before bed.....am still playing catch up! Oh my goodness this is stunning ti say the least. Love how you did the yellow around the flower but leaving some white to set it apart from the cardstock. Wow. I love these as well and have yet to colour the ones you sent me. I am like you, I was really waiting for Spring weather as well. Lol. Love it sweetie. Thanks for the inspiration. Hugs. Absolutely beautiful, Sheila! Your hydrangea looks amazing! Are you by any chance a pisces? Because your stamp collection sounds exactly like mine. Lots of flowers and butterflies. Sheila - I love your colors choices! I too love the white you have around your hydrangea - really makes it pop! So many happy colors :) Enjoy your day in the sunshine! Another beautifully colored image, Sheila! Love the layers and colors! I hope you had an awesome walk! August is not too far away and 60 miles is quite a distance but it must be motivating and inspiring to participate in such an event . I love your colouring Sheila and that white outline border you left around the flower is quite impactful. Good for you for doing the walk! I am proud of you. This card is a serious stunner - I love everything about it, including the touch of edge distressing (at which I am no good at a all). The papers, the ribbon, the inking, the perfect bow, the Candi dot.....simply a masterpiece of great elements. Needless to say the coloring rocks, too.